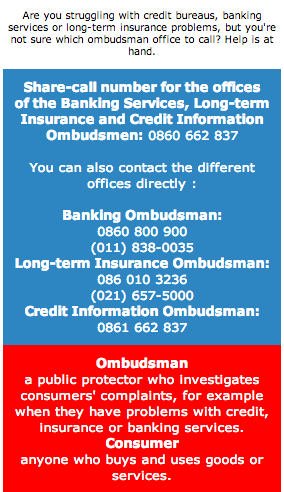 You can now call one number to contact the Banking Ombudsman, the Long-term Insurance Ombudsman and the Credit Information Ombudsman. If you are not sure which of them deals with your specific problem, just call the share-call number 0860 662 837. They will give you advice and connect you directly to the right office. The offices involved in this new service believe it is an important way of making things easier for consumers. 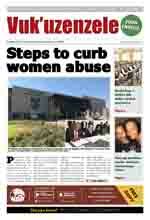 They hope that the other ombud offices in the industry will soon start a similar service to help consumers. Credit Information Ombud, Manie van Schalkwyk, said consumers were becoming more aware that the different ombudsmen can help them and that they can register their complaints free of charge. He said the share-call service will end the frustrations of trying to find out which office to contact and getting hold of the right number. Ombudsman for banking Services, Neville Melville, said the system has proved to be very successful in Australia. Justice Peet Nienaber, Long-term Insurance Ombudsman, said the idea of a centralised number was an important step forward for consumers. "The single telephone number benefits both consumers and ombud offices," he said. The new number is an additional service. It does not replace the existing telephone numbers of the different ombudsmen's offices.